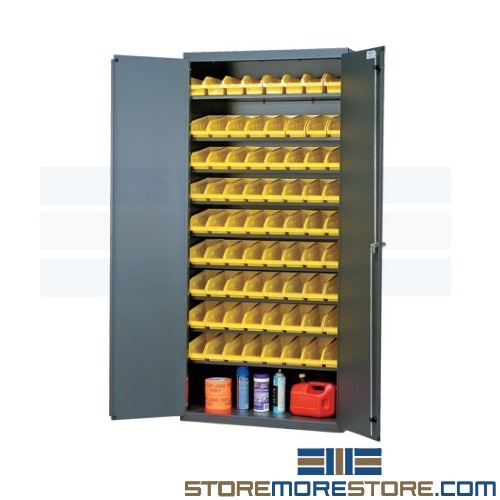 Heavy-duty storage cabinets with a removable bin system provide secure, organized, easily accessible storage. 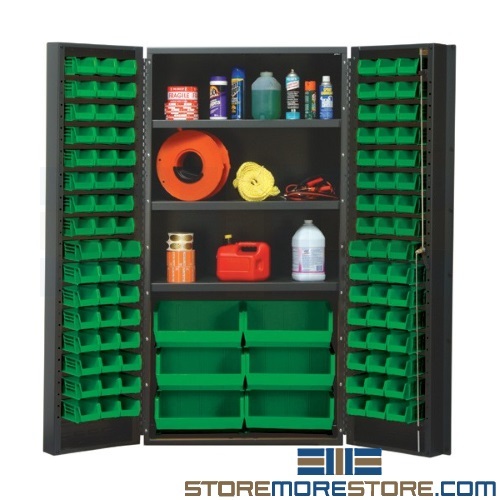 With an integrated bin system and a large number of accessories such as pegboards, drawers, sloped shelves, and more, this is an ideal solution for boosting efficiency in busy workshops that handle storage for items of varying sizes and quantities. The cabinets are also specially designed to use every cubic inch of interior space for maximum storage capacity, allowing you to store more with less. Additionally, you can choose from a variety of models that include anything from storage shelves to louvered panels, hanging bins, drawers, vented or see-through doors, forkliftable bases, and more to fully customize your solution. These configurable elements also allow you to combine your storage for items of varying sizes in one cabinet. Lastly, the heavy-duty cabinets come outfitted with a removable bin system for a full solution. Since they are made of injection molded polypropylene, each bin withstands extreme temperatures and is waterproof and corrosion-free with material appropriate for a variety of applications. A wide hopper front also allows complete access to bin contents, and optional slanted shelves provide improved visibility. Removable bin system cabinets are available to buy online and ship within 10-15 days with free dock-to-dock shipping included. If you need any assistance or just want some help picking the right solution for you, please call us at 1-855-786-7667.